A couple of quick tables based on today’s announcement about which organisations are getting what cash from Arts Council England (ACE) from 2015-18. They’re what are known as the National Portfolio organisations. Over the three years ACE will be spending just over £1bn on them – around £100m of it in Yorkshire. 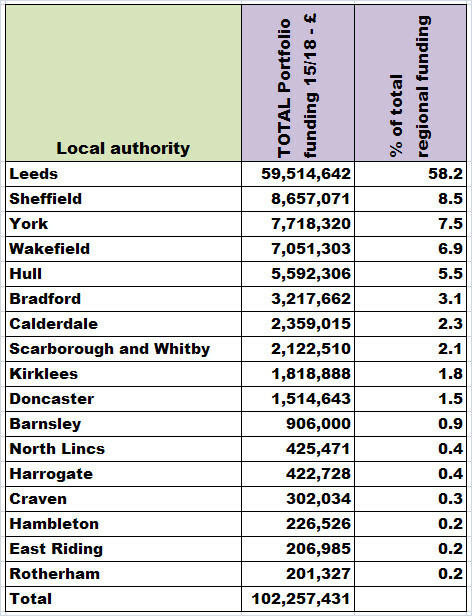 Here’s a breakdown of where the cash is going in the Yorkshire region by local authority. And here’s a little table showing how much of the total cash for the Yorkshire region (48.7%) is snaffled by the top four big Leeds arts organisations. You can draw your own conclusions from the data, but here’s one: Opera North gets more funding than all the organisations in Sheffield, York, Bradford, Hull, Kirklees, Doncaster and Barnsley combined. This entry was posted in Uncategorized and tagged arts council england, arts spending, leeds, national portfolio organisations, Opera north, yorkshire. Bookmark the permalink. Interesting stats. Not sure your “big 4” analysis gives an especially accurate picture though. There’s a huge gap in financial terms between the two higher funded organisations and the rest (£26m difference between Opera North and WYP over 3 years compared to £840k between Sheffield Theatres and WYP over the same period). Both Sheffield and WYP are behind other producing theatres in the ACE Northern area in Manchester, Liverpool and Newcastle. WYP is the best ACE funded producing theatre in Yorkshire but we’re still lagging behind comparable theatres in Chichester, Birmingham, Leicester as well as those afore-mentioned Northern Theatres. If you want to meet up I’m happy to talk you through how we are diversifying our audience and working really hard to reach communities throughout Leeds as well as supporting artists at all stages of their career. Hi James, I can understand that highlighting the “big four” might seem a bit arbitrary on my part and that the gap between WYP and Sheffield Theatres is not that substantial. All I did was take the top four “earners” that appeared on the Yorkshire list once I’d sorted it – and they all happened to be from Leeds (and accounted for nearly half of the Yorkshire regional total). Totally accept your point about the gap between WYP and theatres in Manchester, Liverpool, Newcastle and elsewhere in the country. There’s no criticism intended of the WYP in any way. I’m aware of the work you do to diversify your audience and have really enjoyed my occasional visits to the Playhouse in recent years. James you state that you support “artists at all stages of their career”, However are you willing to state what percentage of key artistic roles, (within the two main spaces, with a budget of over £10,000) since your inception have been from the Yorkshire Region? Directors/Designers/Writers and Actors? Thank you. Silence speaks volumes. Apologies. Please don’t interpret my silence as anything other than the fact that we’ve had a press night and a season launch today. This is the first chance I’ve had to reply. I’m a bit confused by your exclusion of projects with budgets of less than £10k however. We do a lot of great projects with smallish budgets (our talking heads community centre tour for instance was made on a pretty low budget, though not as small as £10k and it has been a great success and a project I am as proud of and committed to personally as anything with a bigger budget). Also to provide opportunities for artists “at all stages of their careers” by definition, means creating all kinds of different ways of supporting and investing in artists both local and from further afield. It’s not solely about opportunities in the main spaces. Plus, co-productions slightly confuse the picture because we’re not driving the casting or the recruitment of the creative team (which is why a simple percentage isn’t that helpful). Nevertheless, off the top of my head (and it is late) in the last 6 months, of the 6 “main” shows we have originated, over 80% of directors have been from Yorkshire, 30% of actors, 30% designers and 50% writers. If you widen the net to include Manchester and other North West-based artists those figures go up considerably. If you then include people born here who have chosen to live elsewhere they go up still further. If you then include other opportunities (like Play Pie and a Pint, transform 14 commissions and scratch performances) the numbers go up further still. We want the best we can find in every discipline. Being from a particular place shouldn’t automatically qualify you for work, just as local actors shouldn’t have to only work locally. Since I’ve been back in Leeds I have approached a number of local actors for parts in major productions on a number of occasions, who just haven’t been free. Having a vibrant and engaged local theatre ecology is really important to the Playhouse and we have a role to play in that, a role that we’re excited about and committed to. But just as local actors are able to work wherever they want and still have a home here, it’s important that we can bring artists of the highest quality to work in Leeds, wherever they may be from. Widening the debate slightly, it may you interest to know that we engaged over 500 artists last year to create work in our theatre, with 22 commissioned pieces plus 8 new plays. We’re still going through a process of transition but longer term, we want WYP to be a place where local artists can create as well as a place where artists from all over the world are interested in making great work. I hope you can be a part of that process. James, a great reply and can I say how nice it is to have someone, especially at the top of the organisation willing to reply in detail. I agree with just about everything you said. The question is not about us assuming that we have an automatic right to work in our area. It is about the effectiveness and outcomes of the investment that you are making. If this investment was sufficient, then logic predicts that you would not spend extra budget on accommodation and per-diems to fill these roles. There should be a percentage of highlighting talent of the nation and world within the building but 30% represents either a systematic lack of development within the area creating a position where this pool is not up to par and therefore have to ignore it or an organisational structure that just ignores this resource altogether anyway. You are the West Yorkshire Playhouse and I do feel there there should be a policy confirming your support for Yorkshire (but, yes one that does not guarantee it) “of using Yorkshire actors where available” or “We prefer to support local creative s” rather than just stating your right to choose. Perhaps you would be willing to make your procurement policy for creatives public? Perhaps we can then take confidence in your support of Yorkshire at the West Yorkshire Playhouse. Why do I choose large spaces over 10k? We will ignore the argument that the smaller production are token gesture in response to being forced by the arts council, I mean it did come at suspiciously simulator time that they announced that they wanted NPO’s to support smaller productions. It’s not like you have just been thrown them into the foyer giving them zero understanding of creating content for your two larger spaces. It’s not like you are still automatically taking Assistant Directors from Burkbeck In London rather than offering them as further training opportunities. No. The reason why I suggest the main space above 10k is because artists spend lifetimes carving out careerers hoping to get access to those two spaces. It is the goal which most want to achieve. We know it’s a risk, that the leap from studio thinking to Quarry is a massive leap but without that chance in our backyard what chance do we have anywhere else. We don’t want to ushered in but we do want to know that we have a man who will open his eyes and see the talent knocking on his door and not just pointing at the box office. I am being unfair, you deserve to be held as saint against your predecessor. You strides are great and certainly in the right direction. There is a long way to go and I know you are attempting to get there. We love the playhouse. We love what you are doing, but please for the first time in thirty years. Open the door fully, don’t just let us play about in the entrance. You can argue about where the benefits (economic, social, marketing, reputational) of a company that does a lot of touring go, but I’d be surprised if Leeds wasn’t the main beneficiary. What I said, though, was that “Opera North gets more funding than all the organisations in Sheffield, York, Bradford, Hull, Kirklees, Doncaster and Barnsley combined”. And Opera North, as we know, is an opera (rpt opera) company based in Leeds, which, apart from the Arts Council cash, receives £2.19m in grant aid from Leeds City Council every three years. Clearly there’s a real need to fund ballet and opera before anything else. Its just so obvious why this is the case. They both are so totally relevant to contemporary questions about life, the universe and everything. All the kids I see in BD 2 are just gagging to get down and dirty with Parsifal and those swan impersonators. OK its not Rod Hull and Emu, but they really tick all the boxes in the East Ward Labour Club. So get over it Class Warriors, yah? Another interesting way of breaking down the figures is to look at spending per artform. The comparison with Bristol, a possible competitor against Leeds to be capital of culture, is very interesting. Taking out Opera North and Northern Ballet to make the comparison clearer. We can go further and strip out everything but theatre. Think I get it. Are you saying we’re a “THE-A-TER” city with little of the rest? If so, that’s before you count the Leeds Grand, the home of musical theatre in Leeds, that puts on great, big shows but operates at a permanent deficit with no NPO funding. It’s interesting what does get NPO support in Bristol: St Paul’s carnival, Knowle West Media Centre, (a media arts organisation with a permanent base on the Knowle West estate on the outskirts of Bristol), and the Watershed (arthouse cinema and also lots of interesting stuff with arts and technology, research collaborations with the University, etc etc). Small and medium sized organisations doing lots of different kinds of stuff with lots of different people in different parts of the city, and probably spending most of their NPO and other income locally. I think you do need to look at the figures. I can’t get them to add up as you have done. Could you confirm how you get such a high figure for Leeds theatre? Also, why compare with Bristol? A fairer point of comparison in terms of population and demographic is if you could let us know what ACE spend on theatre in Manchester, Newcastle, Liverpool or Birmingham compared to Leeds. The comparison with Bristol is because both Leeds and Bristol are considering bids to become capital of culture and that makes a lens to compare their “offer”. And more importantly, to ask what kinds of fun, enlightenment, new ideas… their citizens can look forward to experiencing. The interesting thing about the figures, and I’m happy to stand corrected if they are wrong, is that they suggest Bristol has a diverse funded arts scene and Leeds has a monoculture. If there is something valuable to be demonstrated by comparison with other cities, please do say, and reference the figures. Anyone heard of ‘Mexborough’…? Fifth biggest town in South Yorkshire and doesn’t get a penny. In fact it would probably be into the negative. The problem with getting wrapped-up in figures is that you can fail to notice that, regardless of who’s getting what, Leeds isn’t monocultural. I agree completely, which is why it’s surprising – and as things stand the figures still look right – that NPO funding of the arts is so focused on one artform in comparison to what is possible (as demonstrated by Bristol). I’m looking at NPO funding, which covers only a tiny fraction of the cultural activity happening in any city. Culture includes everything from dancing in a club to going fishing to uploading a photo to instagram and many many many other things. 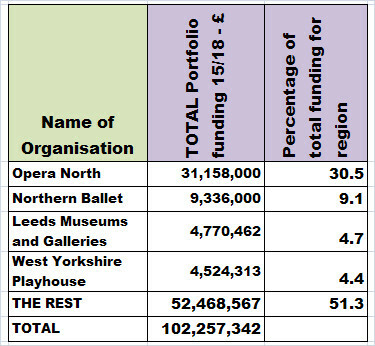 NPO funding just reflects the activity that is visible in Leeds to funders, but these are substantial amounts of money which guarantee stability and time and capacity for the organisations involved, and it looks like theatre is crowding out support for other possible activity (without even taking into account opera north and northern ballet). I look forward to seeing corrected figures. I’ve triple checked but I’m not an accountant so mistakes are easily possible. I don’t think there’s anything surprising about it. Culture isn’t determined or generally reliant on Arts Council funding. Rather, AC funding is to support those art-forms that, nowadays, are not always profitable but desirable – whether the likes of free galleries or subsidies theatres. So I disagree that this means that the likes of theatre are “crowding out support for other possible activity”; which would anyway contradict your “surprise” that Leeds isn’t monocultural – i.e. that other activity isn’t actually croweded out.